Yesterday at the Ghanian independence day, I came to talk about Ghanaian clothing with some people attending the same celebratory event. We said, on a day like this, why are people not waiving the Ghanaian flag, attending parties in wax print and local cuts? I was wearing my waxprint patchwork pants and a Golden Baobab t-shirt and he was wearing jeans and a blue striped shortsleeved shirt. He was praising me for always wearing Ghanaian clothes (its true, I often do), but I was saying I feel people in Ghana do patronise Ghanaian attire a lot, compared to other countries. One reason I wear Ghanaian clothes is to better blend in! The President even bragged about his Ghanaian footwear in his State of the Nation address recently! So I said: When was the last time you saw a Brit sporting an “all British” outfit? But here another partygoer jumped in and told us about Benin where two days a week are local wear day and then even the police dons Beninoise clothing. In Ghana, it is once a week, officially. Many companies have a custom-made cloth so for instance bankers will be dressed in their company cloth. However, once a week is not enough for me. I have come to love the bold and colourful prints, the opportunity get any outfit sown for me and anyways, my clothes from an earlier life were all too heavy and warm! 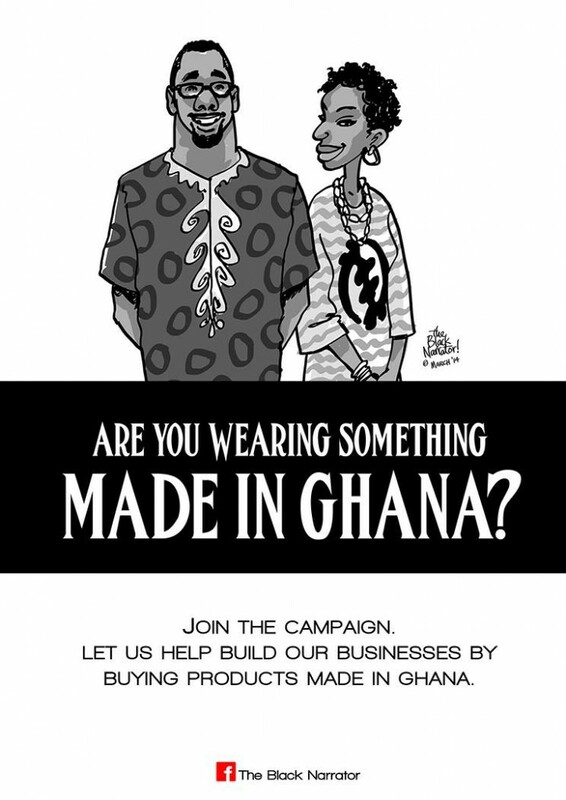 Today, this campaign was started: are you wearing something made in Ghana? I say, stop me if you can! I love to wear my made in Ghana shirts as often as I can. Nice piece. I’m sure most Ghanaians will love to wear made in Ghana all week ,but then again comparatively they are much more expensive. Indeed, once is not enough! I love me some Ghanaian wear. Hehe. It is simple, elagant, and comfortable. I am as confused as Efo Dela, when folks don’t see tham as ‘official’ wear. We dont wear them because of the prints. Why cant they stop prints that has not to do with ghana. We dont wear them because when you wear them you look like a strick wearring a shirt.